This tutorial will demonstrate how you can use Corosync and Pacemaker with a Floating IP to create a high availability (HA) server infrastructure on DigitalOcean. Corosync is an open source program that provides cluster membership and messaging capabilities, often referred to as the messaging layer, to client servers. Pacemaker is an open source cluster resource manager (CRM), a system that coordinates resources and services that are managed and made highly available by a cluster. In essence, Corosync enables servers to communicate as a cluster, while Pacemaker provides the ability to control how the cluster behaves. When completed, the HA setup will consist of two Ubuntu 14.04 servers in an active/passive configuration. This will be accomplished by pointing a Floating IP, which is how your users will access your web service, to point to the primary (active) server unless a failure is detected. In the event that Pacemaker detects that the primary server is unavailable, the secondary (passive) server will automatically run a script that will reassign the Floating IP to itself via the DigitalOcean API. Thus, subsequent network traffic to the Floating IP will be directed to your secondary server, which will act as the active server and process the incoming traffic. Note: This tutorial only covers setting up active/passive high availability at the gateway level. That is, it includes the Floating IP, and the load balancer servers—Primary and Secondary. Furthermore, for demonstration purposes, instead of configuring reverse-proxy load balancers on each server, we will simply configure them to respond with their respective hostname and public IP address. In order to automate the Floating IP reassignment, we must use the DigitalOcean API. This means that you need to generate a Personal Access Token (PAT), which is an API token that can be used to authenticate to your DigitalOcean account, with read and write access by following the How To Generate a Personal Access Token section of the API tutorial. Your PAT will be used in a script that will be added to both servers in your cluster, so be sure to keep it somewhere safe—as it allows full access to your DigitalOcean account—for reference. Please read the linked tutorials if you want to learn more about them. The first step is to create two Ubuntu Droplets, with Private Networking enabled, in the same datacenter, which will act as the primary and secondary servers described above. In our example setup, we will name them "primary" and "secondary" for easy reference. We will install Nginx on both Droplets and replace their index pages with information that uniquely identifies them. This will allow us a simple way to demonstrate that the HA setup is working. For a real setup, your servers should run the web server or load balancer of your choice, such as Nginx or HAProxy. This user data will install Nginx and replace the contents of index.html with the droplet's hostname and IP address (by referencing the Metadata service). Accessing either Droplet via its public IP address will show a basic webpage with the Droplet hostname and IP address, which will be useful for testing which Droplet the Floating IP is pointing to at any given moment. In the DigitalOcean Control Panel, click Networking, in the top menu, then Floating IPs in the side menu. Assign a Floating IP to your primary Droplet, then click the Assign Floating IP button. After the Floating IP has been assigned, take a note of its IP address. Check that you can reach the Droplet that it was assigned to by visiting the Floating IP address in a web browser. You should see the index page of your primary Droplet. If you want to be able to access your HA setup via a domain name, go ahead and create an A record in your DNS that points your domain to your Floating IP address. If your domain is using DigitalOcean's nameservers, follow step three of the How To Set Up a Host Name with DigitalOcean tutorial. Once that propagates, you may access your active server via the domain name. The example domain name we'll use is example.com. If you don't have a domain name to use right now, you will use the Floating IP address to access your setup instead. Whenever you have multiple servers communicating with each other, especially with clustering software, it is important to ensure their clocks are synchronized. We'll use NTP (Network Time Protocol) to synchronize our servers. Select your desired time zone. For example, we'll choose America/New_York. Your server clocks should now be synchronized using NTP. To learn more about NTP, check out this tutorial: Configure Timezones and Network Time Protocol Synchronization. Corosync uses UDP transport between ports 5404 and 5406. If you are running a firewall, ensure that communication on those ports are allowed between the servers. It is advisable to use firewall rules that are more restrictive than the provided example. Note that Corosync is installed as a dependency of the Pacemaker package. Corosync and Pacemaker are now installed but they need to be configured before they will do anything useful. Corosync must be configured so that our servers can communicate as a cluster. In order to allow nodes to join a cluster, Corosync requires that each node possesses an identical cluster authorization key. This software package allows us to easily increase the amount of entropy on our server, which is required by the corosync-keygen script. This will generate a 128-byte cluster authorization key, and write it to /etc/corosync/authkey. Now both servers should have an identical authorization key in the /etc/corosync/authkey file. Here is a Corosync configuration file that will allow your servers to communicate as a cluster. Be sure to replace the highlighted parts with the appropriate values. bindnetaddr should be set to the private IP address of the server you are currently working on. The two other highlighted items should be set to the indicated server's private IP address. With the exception of the bindnetaddr, the file should be identical on both servers. The totem section (lines 1-11), which refers to the Totem protocol that Corosync uses for cluster membership, specifies how the cluster members should communicate with each other. In our setup, the important settings include transport: udpu (specifies unicast mode) and bindnetaddr (specifies which network address Corosync should bind to). The quorum section (lines 13-16) specifies that this is a two-node cluster, so only a single node is required for quorum (two_node: 1). This is a workaround of the fact that achieving a quorum requires at least three nodes in a cluster. This setting will allow our two-node cluster to elect a coordinator (DC), which is the node that controls the cluster at any given time. The nodelist section (lines 18-29) specifies each node in the cluster, and how each node can be reached. Here, we configure both our primary and secondary nodes, and specify that they can be reached via their respective private IP addresses. The logging section (lines 31-36) specifies that the Corosync logs should be written to /var/log/corosync/corosync.log. If you run into any problems with the rest of this tutorial, be sure to look here while you troubleshoot. Next, we need to configure Corosync to allow the Pacemaker service. Save and exit. This will be included in the Corosync configuration, and allows Pacemaker to use Corosync to communicate with our servers. Save and exit. Now we can start the Corosync service. Now that you have Corosync set up properly, let's move onto configuring Pacemaker. Pacemaker, which depends on the messaging capabilities of Corosync, is now ready to be started and to have its basic properties configured. The Pacemaker service requires Corosync to be running, so it is disabled by default. With the prior command, we set Pacemaker's start priority to 20. It is important to specify a start priority that is higher than Corosync's (which is 19 by default), so that Pacemaker starts after Corosync. To interact with Pacemaker, we will use the crm utility. There are a few things to note about this output. First, Current DC (Designated Coordinator) should be set to either primary (1) or secondary (2). Second, there should be 2 Nodes configured and 0 Resources configured. Third, both nodes should be marked as online. If they are marked as offline, try waiting 30 seconds and check the status again to see if it corrects itself. The output of this command looks identical to the output of crm status except it runs continuously. If you want to quit, press Ctrl-C.
Now we're ready to configure the basic properties of Pacemaker. Note that all Pacemaker (crm) commands can be run from either node server, as it automatically synchronizes all cluster-related changes across all member nodes. Again, this setting only applies to 2-node clusters. This will display all of your active Pacemaker settings. Currently, this will only include two nodes, and the STONITH and quorum properties you just set. Now that Pacemaker is running and configured, we need to add resources for it to manage. As mentioned in the introduction, resources are services that the cluster is responsible for making highly available. In Pacemaker, adding a resource requires the use of a resource agent, which act as the interface to the service that will be managed. Pacemaker ships with several resource agents for common services, and allows custom resource agents to be added. In our setup, we want to make sure that the service provided by our web servers, primary and secondary, is highly available in an active/passive setup, which means that we need a way to ensure that our Floating IP is always pointing to server that is available. To enable this, we need to set up a resource agent that each node can run to determine if it owns the Floating IP and, if necessary, run a script to point the Floating IP to itself. We'll refer to the resource agent as "FloatIP OCF", and the Floating IP reassignment script as assign-ip. Once we have the FloatIP OCF resource agent installed, we can define the resource itself, which we'll refer to as FloatIP. As we just mentioned, we need a script that can reassign which Droplet our Floating IP is pointing to, in case the FloatIP resource needs to be moved to a different node. 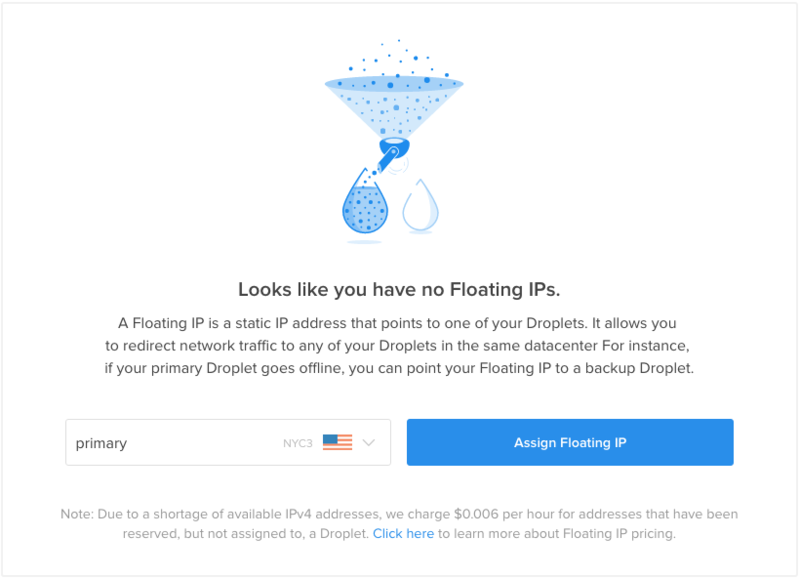 For this purpose, we'll download a basic Python script that assigns a Floating IP to a given Droplet ID, using the DigitalOcean API. Feel free to review the contents of the script before continuing. So, if you wanted to manually run this script to reassign a Floating IP, you could run it like so: DO_TOKEN=your_digitalocean_pat /usr/local/bin/assign-ip your_floating_ip droplet_id. However, this script will be invoked from the FloatIP OCF resource agent in the event that the FloatIP resource needs to be moved to a different node. Let's install the Float IP Resource Agent next. Feel free to review the contents of the resource agent before continuing. It is a bash script that, if called with the start command, will look up the Droplet ID of the node that calls it (via Metadata), and assign the Floating IP to the Droplet ID. Also, it responds to the status and monitor commands by returning whether the calling Droplet has a Floating IP assigned to it. Now we can use the FloatIP OCF resource agent to define our FloatIP resource. With our FloatIP OCF resource agent installed, we can now configure our FloatIP resource. This creates a primitive resource, which is a generic type of cluster resource, called "FloatIP", using the FloatIP OCF Resource Agent we created earlier (ocf:digitalocean:floatip). Notice that it requires the do_token and floating_ip to be passed as parameters. These will be used if the Floating IP needs to be reassigned. Assuming that everything was set up properly, you should now have an active/passive HA setup! As it stands, the Floating IP will get reassigned to an online server if the node that the FloatIP is started on goes offline or into standby mode. Right now, if the active node—primary, in our example output—becomes unavailable, the cluster will instruct the secondary node to start the FloatIP resource and claim the Floating IP address for itself. Once the reassignment occurs, the Floating IP will direct users to the newly active secondary server. Currently, the failover (Floating IP reassignment) is only triggered if the active host goes offline or is unable to communicate with the cluster. A better version of this setup would specify additional resources that should be managed by Pacemaker. This would allow the cluster to detect failures of specific services, such as load balancer or web server software. Before setting that up, though, we should make sure the basic failover works. It's important to test that our high availability setup works, so let's do that now. This indicates that the Floating IP is, in fact, assigned to the primary Droplet. Currently, this will output the same Droplet name and IP address of the primary server. If we cause the primary server to fail, by powering it off or by changing the primary node's cluster status to standby, we will see if the Floating IP gets reassigned to the secondary server. That is, the Floating IP address should be reassigned to point to the IP address of the secondary server. That means that your HA setup is working, as a successful automatic failover has occurred. You may or may not see the Connection refused error, which can occur if you try and access the Floating IP between the primary server failure and the Floating IP reassignment completion. If you check the status of Pacemaker, you should see that the FloatIP resource is started on the secondary server. Also, the primary server should temporarily be marked as OFFLINE but will join the Online list as soon as it completes its reboot and rejoins the cluster. Skip this section if your HA setup works as expected. If the failover did not occur as expected, you should review your setup before moving on. In particular, make sure that any references to your own setup, such as node IP addresses, your Floating IP, and your API token. Here are some commands that can help you troubleshoot your setup. These commands can be useful when configuring your cluster. We won't cover the usage of the interactive crm prompt, but it can be used to do all of the crm configuration we've done up to this point. Now that you are sure that your Floating IP failover works, let's look into adding a new resource to your cluster. In our example setup, Nginx is the main service that we are making highly available, so let's work on adding it as a resource that our cluster will manage. Pacemaker comes with an Nginx resource agent, so we can easily add Nginx as a cluster resource. The specified resource tells the cluster to monitor Nginx every 10 seconds, and to restart it if it becomes unavailable. Unfortunately, Pacemaker will decide to start the Nginx and FloatIP resources on separate nodes because we have not defined any resource constraints. This is a problem because this means that the Floating IP will be pointing to one Droplet, while the Nginx service will only be running on the other Droplet. Accessing the Floating IP will point you to a server that is not running the service that should be highly available. As you can see, the clone resource, Nginx-clone, is now started on both of our nodes. Now, both of your servers should have Nginx running, while only one of them, has the FloatIP resource running. Now is a good time to test your HA setup by stopping your Nginx service and by rebooting or powering off your active server. Congratulations! You now have a basic HA server setup using Corosync, Pacemaker, and a DigitalOcean Floating IP. The next step is to replace the example Nginx setup with a reverse-proxy load balancer. You can use Nginx or HAProxy for this purpose. Keep in mind that you will want to bind your load balancer to the anchor IP address, so that your users can only access your servers via the Floating IP address (and not via the public IP address of each server). This process is detailed in the How To Create a High Availability HAProxy Setup with Corosync, Pacemaker, and Floating IPs on Ubuntu 14.04 tutorial.